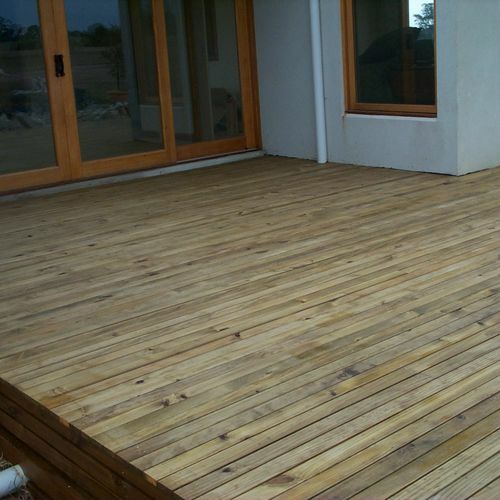 We aim to be your one-stop-shop for decking. Visit us in-store to view our decking display centre and get all the advice you need. 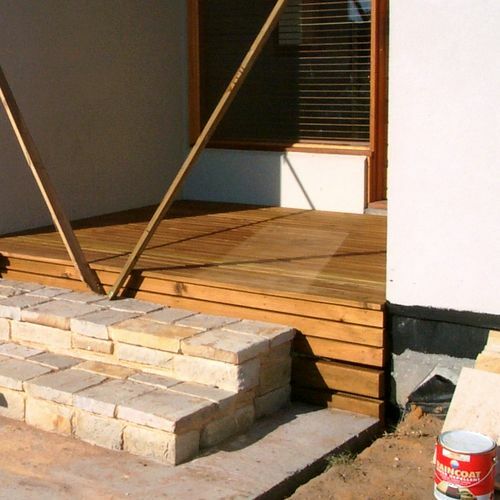 We can supply everything you need to complete your deck from the ground up. From bearers, joists to decking screws. Available in the following set length packs for certain species: 1.8m, 2.4m, 3.0m, 3.6m, 4.2m, 4.8m, 5.4m, 6.0m. Sizes and lengths vary according to the timber species. 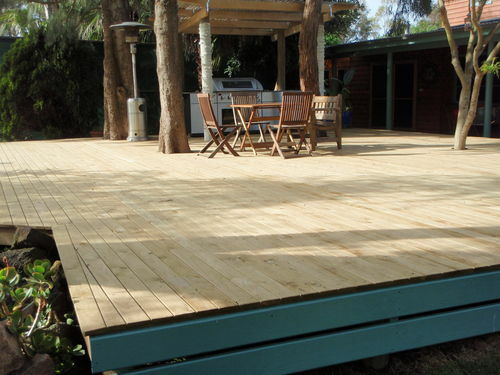 All our decking is treated with ACQ (non-arsenic) preservative. Cypress has a unique look and finish. 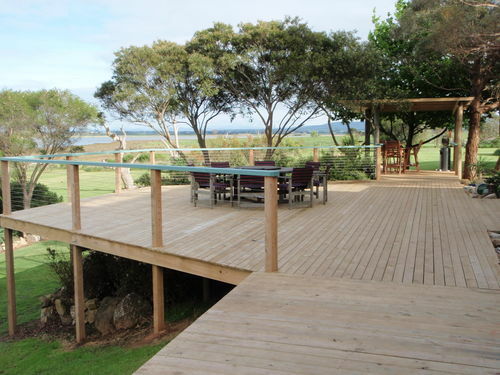 It is an incredibly durable timber and wears very well over time. It is a yellow/gold colour with many small knots and a lot of character. 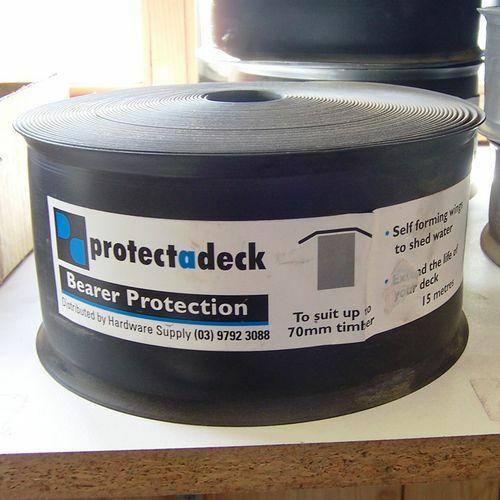 Has always been a very popular timber for many applications. It has an added advantage of natural termite resistance. Sizes available: 70 x 19mm & 90 x 20mm dimensions. 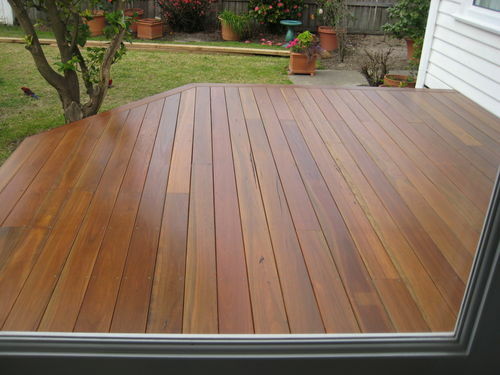 Jarrah is a hardwood grown in Australia. It varies in colour from rich red to a deep brown. It generally has a straight grain with some interlocked grains occuring occasionally. Sizes available: 65 x 20mm dimensions. 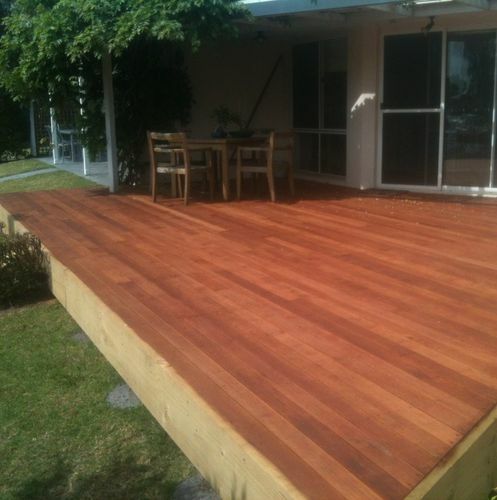 Merbau has a rich red/brown colour and has long been a favourite for landscaped gardens. 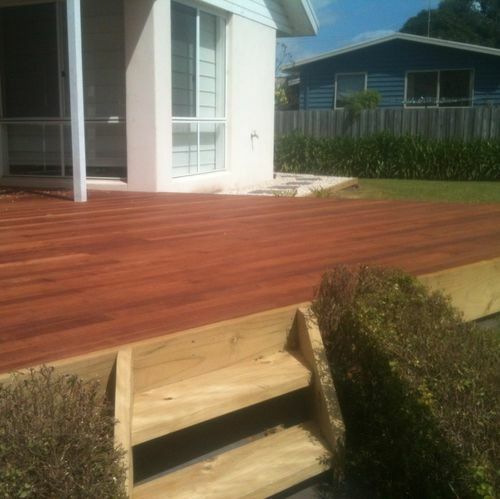 Its deep red colour makes it look modern and stylish as decking anywhere around you home. Merbau also looks great when made into furniture and seating. Sizes available: 68 x 19mm, 90 x 19mm, 140 x 19mm dimensions. Pale brown or sometimes pinkish in colour, a very strong and durable wood. Silvertop has a fairly clear look with an often interlocked grain. It commonly shows small gum veins, pin hole borer marks and pencil streaks. Sizes available: 65 x 19mm, 90 x 22mm, 130 x 19mm dimensions. Spotted Gum has very unique tones. It has a pale yellow/golden colour with beautiful darker streaks and markings throughout. It is becoming very popular choice for timber flooring. It will add a contemporary look to your chosen area. Sizes available: 64 x 19mm & 88 x 19mm dimensions. 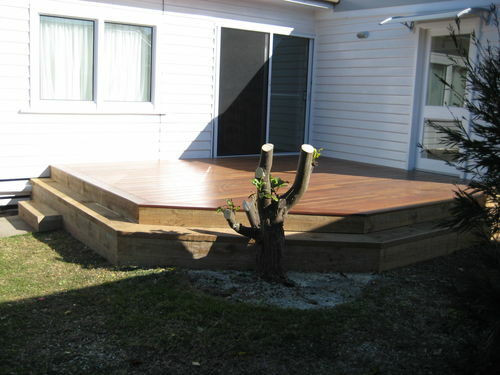 A very ecomonical and popular choice for timber decking. Easy to work with and long lasting. Also comes in set length packs. Very Versatile. 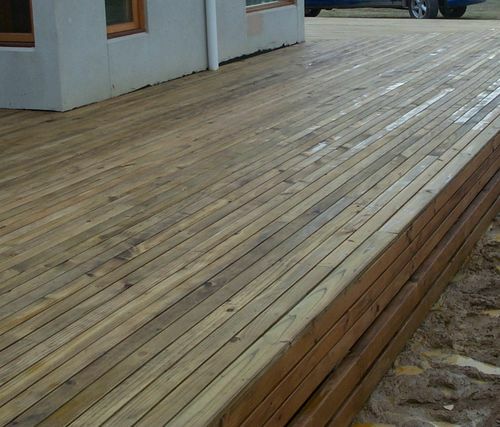 Once laid 'wet' decking may shrink by around 3 millimetres on either side, so take this into account when laying decking. Sizes available: 70 x 22 & 90 x 22 dimensions. A very strong and durable timber. Yellowish-Brown in colour as the name suggests. Has a lot of character with many waves and different colours throughout. Slow drying with minimal shrinkage. Also known as White Mahogany. **Other varieties can be ordered on request, ask our friendly staff today. 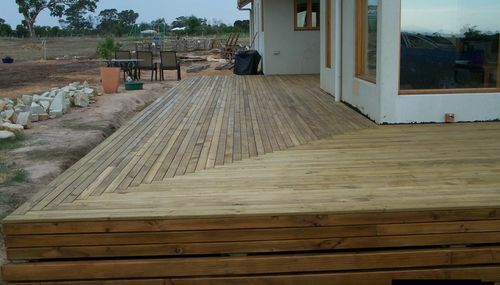 Lay decking with grooved side down as this helps drain water away and prevent rotting. Specialised screws are recommended to secure certain species of timber. Lay weed mat over the area under your deck to prevent weeds from growing through later on. 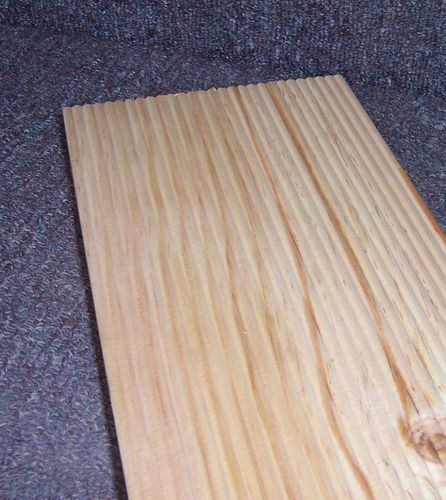 Allow an overhang of about 40mm when laying decking boards, then trim all at once to get an even edge every time.